Increased pork demand in both Japan, China as well as in home-base Canada were the main reasons for Canadian pork integrator HyLife Foods to expand strongly in Manitoba. Plans for a significant expansion of about 9,000 m2 (100,000 square ft) at the Neepawa, MB-plant were announced in the fall of 2016 and the new cut floor is expected to be running this spring, said Claude Vielfaure, HyLife’s president. He said the building of the plant is going according to schedule. The plans included a CAN$ 125 million (US$ 102 million) investment in its central processing plant at Neepawa and new finishing barns to supply it. Headquartered in the central Canadian community of La Broquerie, MB, HyLife employs over 2,000 people, including an additional 165 jobs generated with these new plans. 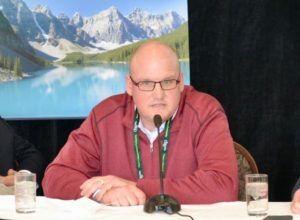 HyLife president, Claude Vielfaure, at the Banff Pork Seminar in 2014. HyLife has built 2 sites for finishers pigs to supply the new facility. Pigs are going in very soon, while 2 more facilities are going up now. A new feed mill will complement the new plans, which will be built at Killarney, MB. The company is processing about 6,800 hogs per day on a 5-day week, and with the new expansion, the goal is to get to 7,500 per day or just under 2 million pigs a year compared to 7 million in 2017. 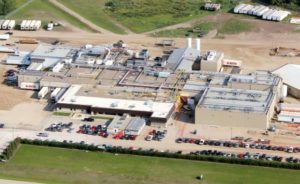 Aerial picture of HyLife’s main plant at Neepawa. HyLife has a strong focus on Japan, growing the market share very well over the years. In a press release announcing the expansion at the time, HyLife stated that it had become Canada’s number 1 fresh chilled pork exporter to Japan, returning CAN$ 200 million (US$ 163 million) worth of sales from the Japanese market annually. The company also opened a restaurant in the trendy Daikanyama district of Tokyo. In that press release, HyLife explained that it has also had a steady presence in the Chinese market, grossing $ 80 million in sales since breaking into the market in 2008. The company had also announced a contract with the Chinese e-commerce platform, JD.com.